SANTA'S LITTLE HELPERS. Every year, elementary students from the Valley Heights School District get the opportunity to shop for immediate family members for Christmas at Santa's Gift Shop. This provides students with an avenue to get gifts for their loved ones if they wouldn’t otherwise. This is hosted by Community Education at the Waterville Fire Department. 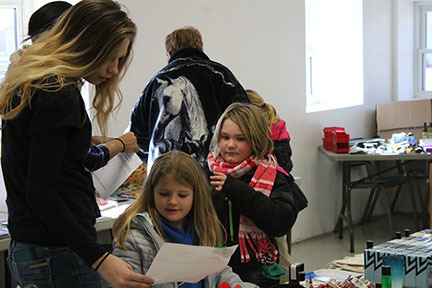 High School students volunteer to help out kids pick the perfect gifts and Valley Heights paras participate in wrapping the presents. “We have been doing Santa’s Gift Shop for over twenty years,” says Community Education Director, Tony Yungeberg. Yungeberg and Candice Brooks are the organizers of this event. They acquire the gifts at discount and closeout prices as well as accepting donations by various community members. This benefits the kids by encouraging them to find special gifts personalized to each family member. “I love being able to help the kids pick the perfect gifts. They get so excited,” says junior, Konner Treff.